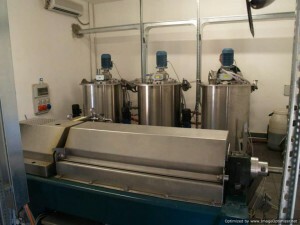 How vacuum olive oil processing came about? How has the olive oil extraction process changed in recent years? We arrived at the year 2010 and realised that in recent years the method of production of extra virgin olive oil has changed a lot. Several years ago growers preferred to pick up the olives and store them in a warm room to dry them before processing; the system was not right as the instruments for oil extraction were not suited to process the olives in some other way. Some years ago with the implementation of continuous extractors the waiting time before processing was considerably reduced; today everyone knows that the fruit has to be processed immediately after picking. We want to start from here, the fruit, which through a special system (3+ System) can give us an oil of unmistakable quality, not only chemical analysis but mainly organoleptic and healthy fresh oil being the result. Why you should not leave anything to chance? Human resources to implement such a system (3+system) are of primary importance. A skilled operator, which also must be the assessor, is careful and accurate in the cleaning of machines, this is required some days before olives are harvested you must verify the perfect functionality of the machinery and prepare the storage tanks for the new production. You should also check there are no strange odours in processing and storage rooms or within the machine itself. The first day of work is dedicated to the cleaning of the machine using specific products such as citric acid, due to its anti-oxidative properties, to sanitise the plant completely. Once you have completed washed the machinery you begin processing with a small batch of say 300 kgs olives, this allows you to understand if the fruit is at the right degree of ripeness, naturally, the first processing will be called (LDF) reference process. Assuming (LDF) is guaranteed to be effected in a period prior to the optimal collection time, you must be very careful to monitor the outdoor temperature which of course can be quite high > 20°C; this will bring risks of activating fruit fermentation, especially if the olives have a high sugar content. 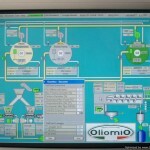 Throughout the working cycle, it will be necessary to quickly work with the mixing phase at low temperatures 22 – 25°C. The expert taster will taste the oil produced giving an evaluation mainly on the astringency, on the bitter intensity and on the balance of the product. Â On the basis of the results obtained it will be decided whether to start harvesting or wait a few days more. 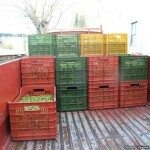 Each company now has harvesting devices or machines that help to speed up the olive harvest, these equipment should also be equipped to intensely clean the product before processing so it is necessary to install a “Twig remover” fitted to the fruit receival section of the machine, until a few years ago was not needed due to many hand harvesting operations switched over to mechanical harvesting. Together with olives branches and twigs arrive at the olive oil extraction plant a substantial amount of leaves which in many cases reaches 15% of the harvest. The olive must arrive at the washing section completely cleaned. Cleaning consists of two steps: washing and rinsing with clean water. 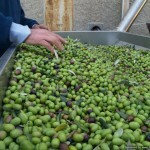 Eventually, the olive must be dried before arriving in the crushing process. You may wonder why and we say that lesser amount of water you add during process higher quality product you extract. In conclusion, the olives harvested with machinery such as shakers, the fruit suffers much stress and must be processed within the day of harvest. The characteristics of extra virgin olive oil are due to the DNA of cultivars plus those modified by the crushing system. During crushing, oxygen is needed in the right quantity to start oxidation actions. Especially in a fast crushing system, where the crusher impeller also serves as an aspirator, you have to control the influx of oxygen through the speed variation and constant filling of the crusher loading hopper. In the crushing phase, polyphenols are available, natural antioxidants which are important for the life of the oil, but above all for the level of health for the consumer (i.e. benefit) that fresh Extra Virgin Olive Oils offer. It seems impossible, but after crushing, polyphenols tend to degrade considerably and especially during extraction. Where, as producers, we act to obtain a more harmonious product naturally from the cultivars in production. There are more instruments that can change the organoleptic aspect/character of the product, one above all is the crushing peripheral speed. Another always important factor is pre-crushing that in many cases are used during an advanced season to capture colour and intensity, then the grate holes that can be varied depending on the cultivar to control paste fineness. At last remember, that crusher blades must be sharp and that the grid, if not rotating, must be equipped with external cleaner (by way of scraper) and over-heating minimisation channels; the olive should not heat more than 2°C compared to the inlet product temperature, since it would result in a bitter oil sometimes very unpleasant. The crusher in the system (3 + System) should never be mounted above the mixer. Unfortunately, mixing is a necessary process, that is why in our system we mix inside a closed tank and even with a slight depression (vacuum), in order to harness polyphenols levels, mixing times are reduced and temperatures are kept not higher than 25°C. The paste arrives into the mixer and once the mixing time passed it is directly transferred to the decanter for extraction. No more mixer to mixer transfer stage and loosing polyphenols on the way. The expert taster will be very important in advising the grinding time on the basis of the tasted product, analytically usually more you increase the grinding time more the polyphenols degrade. Our system (3 + System) will only be equipped with enclosed malaxers. The paste arrives at decanter through a pump and enters inside the cylinder, the system acts to two outputs: one for the oil and the other for pomace and water (mixed together). At this stage, it is very important to avoid using a quantity of water higher than 5%. If you can work without water certainly the result will be even better (water leaches polyphenols). The first oil that comes out, as well as the last, must be put in a special tank containing “normal oil” not in the one containing “highest quality oil”. During centrifugation, unfortunately, the polyphenols are lost. In our system to decrease this loss, there is saturation with an inert gas that cannot be used in all cases, there will be the expert taster to decide the use. Surely a decisive phase on oil quality is the (Quick Filtration). Considering the fact that our system is not equipped with a final separator, in order to remove vegetable residues and traces of dirty water, it is absolutely necessary to filter the oil immediately. Filtering at this stage will allow the oil to become + green but certainly, we treat the oil in such a way that we minimise the risk of oxidation or decay which usually occur after a few months to unfiltered oils. Remember that each time you move the oil with pumps or other; it suffers an oxygenation that is not healthy. From decanter to filter and then to final storage tank, these are the steps that the product must follow. The storage room must be air conditioned and the temperature shall move from 14-16° C. The tanks must be in stainless steel (not plastic) and saturated with inert gas or vacuum, the saturation procedure occurs through filling of gas in the tank, after the extra virgin oil is poured from lower side valve continuously and slow to avoid turbulence/aeration, the gas exits from the tank through the upper safety valve. Another important point: the product shall be bottled only a few days before being shipped, except in the case of stainless steel bottles where vacuum procedure is made before capping, for dark glass bottles, the passage of light is approximately 70%, then the oxidation risk is real. Bottling extra virgin olive oil seems to be a simple operation without any difficulty, but you must be very careful to ensure that the oil goes into the bottle without creating turbulence/aeration and that before inserting the cap that all oxygen is removed that usually remains between the oil and the cap. By doing so the oxidative effect is considerably reduced. Finally, we remind you that if you want to avoid problems, extra virgin olive oil has to be bottled some days before delivery. Each cultivar produces a different extra virgin olive oil, so different types of processing are required. The skill of the expert taster is important to get the best product; the system provides different solutions that can be interpreted in a unique way. An important factor that applies to all is that using our system (3 + System) you are sure to extract more polyphenols from the olives that range from 50 to over 100% compared to conventional processes. The water must be used only in extraction, if necessary, but always in low quantities. Lastly, one more important point is the cleaning of the machine which must be carried out daily and accurately in order to achieve the best product.